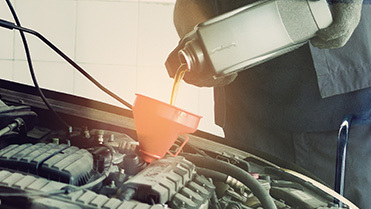 Your vehicle relies on a number of fluids to keep it functioning. Most car owners know that engine oil is vital to the vehicle’s longevity. Without engine oil, the engine would be damaged and would have to be replaced. Regular oil service ensures the engine oil levels don’t get too low – though you should check engine oil level between the services as well. In most cases, once per month is sufficient, unless you have been warned that your vehicle consumes oil at an accelerated rate. Replacing old engine oil with fresh engine oil decreases probability of engine problems and improves engine longevity. When we drain the old oil during an oil service, we remove the dirt and debris that the old oil collected. We also replace the oil filter as well. Fresh engine oil lubricates the engine better than used one – old oil was subject to high temperature which, over time, caused it to have decreased ability to lubricate. Synthetic oils stand up to high temperatures better than natural oils, that’s why at Fremont Auto Center we only use full synthetic oils when performing an oil service. We suggest following manufacturer’s recommended service schedule – most modern cars will let you know when the next service is due. Should you have any questions or concerns before the manufacturer recommended interval is reached, feel free to give us a call – we will be happy to inspect your vehicle to make sure that it is performing as designed. Being the owner, you know how your vehicle behaves, how it handles, how it sounds – if you notice any changes, and those changes make you feel uneasy – it’s worth a quick trip to Fremont Auto Center to regain your peace of mind. We are happy to be of service. For your convenience, we are open Monday through Friday, as well as on Saturdays (by appointment only). So if your car needs an oil service, or you are concerned that it’s not 100% healthy, give us a call.